I know I’m not alone in admitting there are few cars I’d rather own than a classic E-Type. I can only imagine grasping the wooden and metal-spoked wheel of a 3.8-litre Series 1, cycling through its four-speed Moss “crash box” while tackling the hairpins of Switzerland’s glorious Furka Pass or California’s Big Sur. I drove an early E-Type two-place Coupe early in my writing career, and the experience is indelibly stamped in my memory. It was hardly the fastest or best handling sports car I’d driven to that point, despite being one of the best of its era, but the true allure of a well-designed sports car isn’t only experienced at high speed. That will be a tale to tell my future grandkids some day, which makes me wonder if I’ll be relaying similar stories about the good old days of driving the E-Type’s spiritual successor, the near certain collectable F-Type. I haven’t had the pleasure of taking hold of this modern-day classic’s leather-wrapped wheel on the roads of Southern Cal or Europe, but I’ve enjoyed many wonderful miles right here on the West Coast. The Sea-to-Sky highway that curves its way from West Vancouver’s British Properties all the way up to the gorgeous resort hideaway of Whistler is a picturesque ribbon of circuitous tarmac, as is the short run up from the same starting point to Cypress Bowl, or the even more engaging two-laner that finalizes atop Mount Seymour. I’ve driven F-Types on many a challenging roadway, these the sorts of routes driving enthusiasts seek out when in possession of a brilliantly capable sports car; and believe me, the new F-Type is everything its cracked up to be and then some. Its actual predecessor is the XK, a model that arguably provided more visual clues to its E-Type heritage, such as a wide oval grille and long, flowing, curvaceous body panels, but where the XK was more of a high-performance boulevardier when introduced as the XK8 in 1996 and finally a super coupe and convertible when bowing out as the XKR-S in 2014, the F-Type reintroduced light and lively sports car capability to Jaguar’s range, which was the true spirit of the original E-Type. That it also boasts gorgeous lines, a beautiful interior, and phenomenal performance while delivering good value make it one of the top sellers in its near-exotic sports car class. The big news for 2017 is the new range-topping F-Type SVR pushing 575 horsepower and 516 lb-ft of torque to each of its four wheels. The 550 horsepower all-wheel drive R is carried forward the same as last year’s, as is the 380 horsepower S in rear- and all-wheel drive variants, and 340 horsepower base model, also offered in RWD and AWD. Likewise, you can get every one of these trims as a two-door Coupe or Convertible, the former featuring a sloped rear roofline ending in a practical liftback, and the other incorporating a high-quality fabric top ahead of a regular trunk. The car we bring you today is the latter with the base engine and just a few upgrades. While it doesn’t sprint to 100km/h in a mere 3.7 seconds and top out at 322 km/h like the new SVR (the SVR Convertible hits its limit at 314 km/h), the base F-Type Convertible incorporates an energetic 3.0-litre supercharged V6 capable of 5.7 seconds from standstill to 100km/h and a top speed of 260 km/h with the six-speed manual or 5.3 seconds an the identical top speed with the as-tested paddle-actuated eight-speed auto, which is more than enough to raise the heartbeat. Of course, I couldn’t help but exercise my right of temporary possession by putting it through its paces. The last time in an F-Type wasn’t long ago, a 2017 R Coupe powered by a rapturous sounding supercharged 5.0-litre V8 pushing 502 lb-ft of tire-smoking torque down to all four 20-inch Storm forged black alloys on ZR-rated Pirelli P Zero rubber, the stunning two-door hardtop launching from standstill to 100km/h in a knee-weakening 4.1 seconds before attaining a 300km/h top speed (which I never even came near attempting). Despite the considerable straight-line performance discrepancy, I still had to question why I’d pay more for the outrageously powerful V8. Of course the acceleration numbers don’t lie and the seat of the pants thrills of that engine and the car’s handling upgrades epitomize spine-tingling fun (so don’t get me wrong, it’s worth every penny), but the sweet note of the base model’s V6 and dual-exhaust combo, plus the pleasurable pull of its still significant output makes it a brilliantly engaging drop-top just the same, with much more available speed than any public roadway can contain. On the road the F-Type is like no other sports car, complete with its own unique personality. 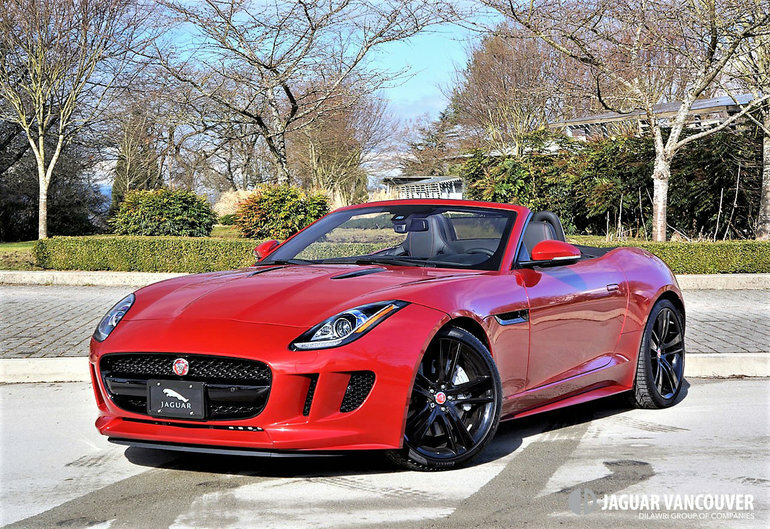 The base F-Type has Jaguar’s classic front-engine, rear-drive layout, just the way I happen to like it best. The engine is mid-mounted behind the front axle for ideal balance, and the car’s bodywork and suspension is mostly formed from lightweight aluminum for a slight 1,587-kilo curb weight, which is a mere 20 kilograms more than the F-Type Coupe. Its power to weight ratio is spot on, and ability to slice through the most circuitous sets of consecutive switchbacks at rapid rates of speed downright shocking in its seeming ease. Don’t get me wrong, it’s a thoroughly engaging sports car, delivering the high levels of feedback craved by enthusiast drivers, but it gets the job done so effortlessly it would be anticlimactic if it weren’t for little controlled slides at the rear wheels and that sonorous exhaust note I keep going on about. Take it down a notch or three and it’s easy to see that Jaguar doesn’t skimp on interior quality, with rich stitched leather across the dash top, around the sides of the centre stack including the buttress-style handle on the passenger’s side, across the door uppers and then all the way down to the very bottom of the door panels as well as the lower dash. Jaguar even covers each roof pillar and inside edge of the windshield cross-member in stitched leather. Truly, the detailing is otherworldly, the stuff of the ultra-luxury class that normally costs hundreds of thousands more. Some of my tester’s stitching was in black, with other areas done in red, but interestingly the fabulous flat-bottom leather-wrapped sport steering wheel was laced up with the former. The wonderfully comfortable and fully supportive sport seats were finished in black leather and laced with red thread, for a particularly attractive look. They featured a multitude of adjustments including adjustable bolsters that pinched backside in order to hold torso in place during aforementioned fast-paced cornering. Three-way memory for both seats made it easy to find favourite seating positions, and while I’m only five-foot-eight I would imagine there’d be plenty of room for most body types. Of course, being a convertible there’s unlimited headroom as long as it’s warm enough outside, but for colder, wetter weather there was a good five inches above my head, and it’s a very nicely finished soft top as well, with an insulated fabric liner. It goes up and down quickly at the touch of a lower console-mounted switch, allowing you to take advantage of sudden sunshine or vice versa on the fly. Also powering up and down are the centre vents, which can be hidden away if you’d rather see a more aesthetically pleasing dashboard, although they look nice enough open and do a very good job of providing ventilation, combined with a set of large corner vents. Such details in mind, the F-Type has beautifully crafted switchgear, especially the scrolling dials for controlling those vents, these rimmed in metal with rubber centres for added grip. Additionally, attractive solid feeling composite toggles and rocker switches can be found throughout the cabin, also finished with grippy black textured surfaces and satin-finish metal edging. The look is top-tier, and the functionality superb. In fact, all of the F-Type’s switchgear is far above average, with excellent fit, finish, materials quality, and design. And let’s remember, my tester, despite a gloss black styling package, those fabulous black alloys and some interior upgrades was mostly in base trim. The 2017 F-Type Convertible starts in the low $80k range, with notable features including proximity sensing-access with pushbutton ignition, a powered tilt and telescopic steering column with memory, powered leather seats with memory, an auto-dimming rearview mirror, 8.0-inch touchscreen infotainment with navigation, a rearview camera, 380-watt Meridian audio, satellite and HD radio, auto climate control, rear parking sensors, a dynamic rear spoiler, active sports exhaust, a Dynamic sport mode, auto engine start/stop, an electromechanical parking brake, plenty of active and passive safety features, and much more. Suffice to say the F-Type is the purest of sports cars gentrified for a luxury lifestyle, a car with the power to move one’s soul yet embodied with the calming spirit of graceful style, craftsmanship and quality that can easily sooth an aching mind after a demanding day’s challenges. Therapy from behind the wheel? As any Jaguar owner can attest, life with one of the British marque’s cars rates at a higher level, and spending part of each day with the F-Type raises one’s game yet again. It’s the attainable modern-day equivalent to the E-Type, effectively delivered in one fabulously performing, luxuriantly equipped, intelligently safe, sensibly reliable package. You truly must partake.